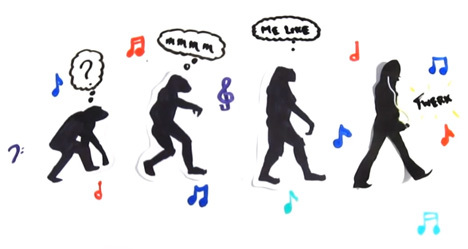 According to a YouTube video from fantastic science goofballs AsapScience, music is “the combination of audio frequencies and intricate patterns floating through the air and clashing in your ear.” This is the first step in a distilled, yet entertaining, explanation of why music makes us happy. “The Scientific Power of Music” uses everyday objects, sketches and animation to inform the viewer of the neurological links between music and mood. Dopamine is the neurotransmitter behind the positive feelings music gives us and is released when an enjoyable tune is heard. The brain actively seeks these relationships, seeing them as a necessary function through the reward factor – the same cognition behind drug use. Like its subject, this video is easy on your mind. See more in Earth & Nature or under Science. September, 2013.